This is a picture Josh brought home from school today. I asked him what it is and he said it's a drawing of his family. I asked him to tell me who each person was and he went down the order. 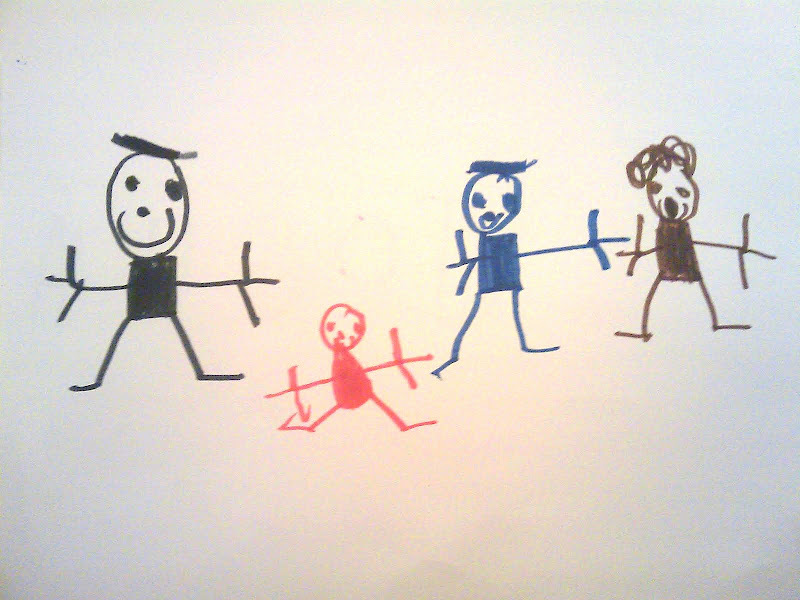 He said the one in black is Dad (apparently with a flat-top haircut), the red one is baby Rebecca, the blue one is Mom and the brown one with the curly hair is Josh. I then proceeded to ask him where Alex is. And he said, "Ooohhhh I FORGOT Alex!" Poor little guy. As if it wasn't hard enough to adjust to a new school and deal with potty training, he now has to remind his brother that he's actually a part of the family. Josh's art skills are getting much better though and his handwriting at times is more legible than my own. Sad but true. Thanks Montessori teaching! Hahahaha. I can hear Josh saying that.